The Dunlop Biomimetic Ultimate racketball racket has a head size of 106in2 (683.8cm2) to ensure explosive power and lets you manoeuver and swing more quickly thanks to a head light balance. This stiff and powerful choice offers the AeroSkin CX technology to increase the racket’s aerodynamic properties and provides greater comfort, feel and control due to BioFibre technology. The Power Ridge technology increases stiffness, whereas the MoS2 Grommets guarantee improved grommet durability and less friction. 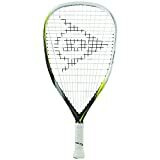 The racket features a 14×19 Powermax string pattern and comes with a full cover for protection when not in use.